But you too confide in me, tell me your ancestry. You were not born of mythic oak or stone. Tonight please read “The Suitors, “Penelope,” and “The Challenge,” pp. 1029-1037, and then respond here. In your response, please you may choose to consider some of these questions, or perhaps you will have a question of your own! How does Penelope feel about the suitors in her house? How might these feelings differ from Odysseus’ feelings? 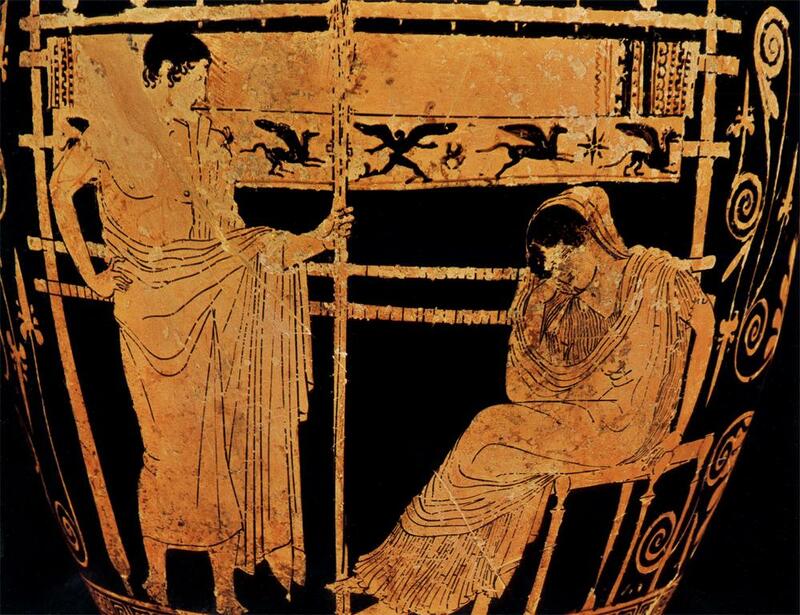 Why does Odysseus choose not to reveal himself at once to his wife? Is it wrong for Odysseus to deceive his wife? How are present-day ideas about gender equality similar to or different from those demonstrated in The Odyssey. Posted on February 9, 2018 by equinson	• This entry was posted in Mythology. Bookmark the permalink. After rereading pages 1029 to 1037, I am curious about the gender role Penelope has. Penelope seems to be unable to run anything since she is unmarried. According to historylink101.com “Women had no role in politics. Women with any wealth did not work. They stayed indoors running their households. The only public job of importance for a woman was as a religious priestess.” Penelope follows these rules. This opinion on women has dramatically changed. In modern times women have all the abilities men have. So, unfortunately, Penelope needs a suitor to control her palace. That and the fact that the suitors were armed prevents Penelope from evicting her suitors. How does Penelope think of the suitors invading her home? When talking about the suitors Penelope says, “Oh, Nan, they are a bad lot; the intend ruin for all of us; ut Antinous appears a blacker-hearted hound then the rest ( Lines 172 to 174).” Furthermore, earlier, the maid mentions that they have been hoping for all the suitors to die. Other than Antinous, Penelope is too kind-hearted to want the other suitors to die like her made does. So Penelope wishes Antinous death and the rest of the suitors to leave. Odysseus has slightly harsher believes. He wants all the men to be punished by death for what they have done. In Odysseus’ Revenge, Odysseus even turns down a reasonable offer that would let the suitors survive because he is intent on killing all of them. Odysseus and Penelope both dislike the suitors and want them to leave, but Odysseus’ feelings differ because he wants all the suitors to die, not just Antinous. Although the suitors were bad, I don’t believe Odysseus’ is even justified in killing the suitors just because they harass him and his wife. I agree that they should be harshly punished, just I don’t believe going as far as murder. In this part of the Odyssey, Odysseus comes home to Ithaca. People assumed he had died and a lot of men came to get married to his wife Penelope. She hates all the men that have come and still believes Odysseus is alive. “‘Sons of the noblest families on the islands…are here to court me, against my wish; and they consume this house.’(Pg. 1032)” Penelope doesn’t want to get married to any of the suitors and they came and took over her house. Odysseus feels the same way except he probably doesn’t care as much about the house. Odysseus wants to get rid of all the men. Odysseus doesn’t reveal himself to his wife because he wants to fight the suitors. Instead, he goes into the palace as an old beggar. Antinous, who is a suitor, throws a stool at him when he asks for bread. Odysseus walks away knowing he will kill him later. Penelope sees this incident and calls the beggar, who is Odysseus, to come talk to her. Here, Odysseus could have told her of his true identity but doesn’t. This decision isn’t wrong because he has good reason not to tell his wife. He will fight the suitors later. In this reading, we can see some aspects of gender roles. One is how it is assumed Penelope will get married after Odysseus is presumed dead. Penelope clearly doesn’t want to but doesn’t have a choice. Also, the suitors want to marry her for her husbands land. Why can’t she just keep the land? The gender role will not allow her. The gender role about a woman having to get married is still around today. It is considered weird if a woman doesn’t get married. However, a woman can own land today and it isn’t uncommon. Odysseus waits and the next Penelope says that whoever can shoot Odysseus bow through twelve axhandle sockets can marry her. Sure enough, everyone fails and Odysseus, who is still disguised as an old beggar, succeeds. Nice article! The world today is pretty different from the past, but also the same. However, there are women who try to forever stay single, or a maiden or virgin. In fact, there are some Greek goddesses who tried and succeeded in being a maiden goddess, like Artemis. It”s quite ironic actually, since apparently she is the goddess of childbirth and virginity. Today we read about Argus, Penelope, and her suitors. What surprised me most about the story was how foul Odysseus was treated as a beggar guest by the suitors, Antinous in particular. When Odysseus dressed as the beggar came through the door, Antinous said, “‘God!/ What evil wind blew in this pest?/ Get over,/ stand in the passage! Nudge my table, will you?/ Egyptian whips are sweet/ to what you’ll come to here, you nosing rat,/ making your pitch to everyone!/ These men have food to throw away on you/ because it is not theirs. Who cares? Who spares/ another’s food, when he has more than plenty?’”(1029) When Antinous said that he has food to waste on Odysseus because it is not his, he is implying that they are feeding the beggar because the food is not theirs, which brings up the interesting question of, would Antinous treat him that way if Odysseus came to Antinous’ home and asked for Antinous’ food? Would Antinous deprive Odysseus of food if it were his own that he was giving away? The quote certainly suggests that that would be true. The quote also brings up another question. Does Antinous treat all of his guests in the manner that he treated Odysseus, or was he just acting up in front of his comrades? Like I mentioned before, either the guests received at his home were treated worse than Odysseus or better. If they would have been treated worse, that would have been expected. Since it is his own food being given away, Antinous would have likely rejected the beggar. Antinous would have hoarded his food and cattle. But, what if his repulsive behavior was just for show? Antinous could have been kinder and less greedy at his home. He might have been acting the way he was simply because he wanted to catch the eye of Penelope. Personally, I don’t think that it was an act, since he threw a chair at the guest, and even if he was pretending, I don’t think he’d go that far as to mistreat a guest so badly. I am also pretty sure that at home, Antinous would be multiple times worse than he was at Odysseus’. Nice job, (Arina?)! I was also surprised at how nasty Antinous was to his guest. I can’t believe he actually threw a stool at him for asking for food, when he was the one taking others’. In pages 1029 to 1037, the situation in Odysseus’ home between the suitors and Penelope is shown. Since Odysseus had been gone for such a long time, many men from different islands had come to court Penelope, his wife. The men had taken over the household, and were indulging themselves with Odysseus’ food and drink. As a result, Penelope really dislikes them all, especially Antinous. She observes that he is the worst of them all, and wishes him dead by Apollo. “Would god you could be hit yourself, Antinous- hit by Apollo’s bowshot!” Her housekeeper asks, why only him? To which she replies that Antinous seemed to be the blacker-hearted of them all. “Oh, Nan, they are a bad lot; they intend ruin for all of us; but Antinous appears a blacker-hearted hound than any.” On the other hand, Odysseus sees all of them as intruders who have invaded his home. He wishes to kill all of them out of revenge, instead of just one. We know that later on in the story, Odysseus succeeds in shooting the bow through the sockets, and moves on to shoot every suitor in the room. In our society, the women are almost if not completely equal with men in their roles. They can do the same jobs as men, vote, and also have every right that they do. However, compared to the Odyssey that takes place in ancient Greece, a woman could not do as much. As an example, Penelope had no say in whether the suitors could stay or leave, and had no choice in her decision to marry or not. Even hundreds of years later, in the US, women couldn’t do many things, so I imagine they could do even less back then. Great job Tony! I love how well you summarized it and i agree that it’s hard to imagine the power that women had back then. Keep up the great work! In the reading we read, Odysseus lays out his revenge plan on the men trying to court his wife, as Penelope is upset of the men. They keep telling her that Odysseus is dead, and she should marry one of them, so she has to deal with them until her husband comes back, if he will. It leaves her in a bit of despair. Odysseus, he reacts to this by coming up of a plan to get rid of all of those men by killing them while in disguise. That is the reason why he did not show himself to Penelope yet, so he would not blow his cover. Usually, I think that deceiving your wife is wrong, but in this case, he is just trying to help his family, like with Scylla. About gender equality, we can see how much it has changed, and how our views changed. The way the men treat Penelope is unacceptable, but back then it was tolerated. People before never thought of gender equality is significant, even in the early 1900s. Even now we haven’t truly reached gender equality. It may look like we have changed a lot, but mind that this is in a time period of thousands of years. It was only around a century ago were woman able to vote. While I do not like the way the men treated Penelope, there is nothing we can really do about it, even if we were alive back then, because that was just the nature of life to them. After rereading “The Suitors”, “Penelope,” and “The Challenge,” it seems as if Odysseus has forgotten some of the things that he learned on his voyage. In the story, Penelope needed to marry a suitor in order to control her palace. Although, she didn’t like the suitors and neither did Odysseus. Penelope had a plan to stop this madness, the plan was killing Antinous, but Odysseus had a even bigger plan which was to kill all the suitors. Odysseus’ plan was very cruel and completely forgot about the sadness that comes with death. On Odysseus’ voyage many of his friends died which made him very sad and by killing the suitors, he was being the monster who killed people with loved ones and friends. It’s as if Odysseus turned into the monster that killed people who messed with him. I agree with Odysseus that the suitors kept harassing his wife and him and they should be punished but, I can’t stop thinking about the family of that person and the friends who will greatly miss the one who died just trying to get a wife to love him. The text stated, “Antinous hit me for being driven on by hunger”. I found this interesting because on Odysseus’ journey, his friends were driven by hunger to eat the cattle and disobey Odysseus but now, Odysseus is being driven by hunger that is revenge. Odysseus also mentions, “I did not miss, neither did I take all day”. This quote is said after Odysseus kills the men. He mentioned how he didn’t take long to think everything over. I think this is a repeat of a lesson about the power of rash decisions because when his friends ate the cattle when they weren’t supposed to out of a quick decision, the cattle were brought back to life which is gross, and now that Odysseus killed the men, they can’t come back alive but Odysseus will soon feel the guilt, which far worse, of killing men. To conclude, Odysseus forgot some of the lessons he already learned and is soon going to have a more powerful consequence that will reteach him the lesson. Great response Noy! I love all your ideas and opinions. In tonight’s reading of the Odyssey, we see Odysseus return home and the condition in which Ithaca has been left in in his absence. Odysseus returns home, and disguised as a beggar, makes his way to his old home. He finds suitors trying to court his wife, Penelope, thinking he is dead. Odysseus assumes the role that he is disguised as, and begins begging. One suitor, Antinous, tells him that the only reason they are able to give him bread is because it is not theirs. This shows that the suitors are eating and living off of Odysseus and what he has left to provide. Odysseus becomes angry, saying, “You sit here, fat/ on others meat, and cannot bring yourself/ to rummage out a crust of bread for me!” (page 1029). Antinous gets angry at his remark, and throws a stool at Odysseus, which seems to do him no harm. Odysseus fumes, yet knows he will have his revenge later on. Penelope soon catches wind of this and calls upon Odysseus to talk to him. Odysseus, still disguised as a beggar, spins a tale that Odysseus is almost home, trying to lift Penelope’s spirits. She knows that soon she will be forced to choose a new husband, but clings to the hope that Odysseus is still alive. Later, Penelope declares a challenge. She says that any man worthy enough to string the bow of Odysseus and is able to shoot an arrow through seven ax heads with it will be her new husband. All try, but nobody is able to do so until Odysseus is given a chance. He does so with ease, as he, “slid his right hand down the cord and plucked it,/ so the taut gut vibrating hummed and sang/ a swallow’s note./ In the hushed hall it smote the suitors/ and all their faces changed.” (pages 1035-1036). After shooting it easily through all seven ax heads, he is joined by his son, Telemachus, and they turn to all the suitors watching. After reading this tale of Odysseus, we learn a lot more about him and his home island. While away, his home island declined. Before he is able to make his way back, his wife was being pressured and forced into choosing a new husband. She was able to hold off the suitors for some time, yet it was not enough. Penelope clearly hates the suitors as they eat and drink all for free, without even trying to be respectful. This is also illustrated in the fact that she never gives up on thinking Odysseus is living. She always manages to believe that he has somehow survived. Odysseus also hates the suitors, yet in a different way. Where as Penelope hates them for being disrespectful, Odysseus hates them as they have disgraced both him, Penelope and the island of Ithaca. He wants instant vengeance and immediately has a blood lust when it comes to these suitors. He doesn’t just want them gone; he wants them dead. Thus, while Penelope dislikes the suitors because she believes her husband is still alive, Odysseus hates them for what they have done to his wife and home. Great job Matt! You did a really good job summarizing the text, and your analysis is amazing! We see Odysseus’s return to his home in these pages, and he comes home to a bunch of unknown men in his home. These men all assume that he is dead, and are there to marry his wife, Penelope. Odysseus obviously is not pleased by this, and his son, Telemachus, is going to help him get rid of them. Penelope has no strength or power to get rid of these men, so she decides to make up excuces for as long as possible in order to avoid marrying any of them, in hopes that Odysseus would come home. Odysseus, on the other hand, believes that he can overpower and force the men out of his home. Odysseus also decides to not reveal himself to his wife immediately. This may be because he is afraid that if she reveals that Odysseus is home, then the men will all team up on him and kill him. It was not incorrect for him to decieve his wife, as he was probably looking out for the safety of the both of them. Gender equality is clearly seen in this story, as Penelope has no power to force the men to leave her home. They are prestigious men and she is a lowly woman without her husband, and she cannot do anything about them invading their property. I liked your blog. I originally thought it was somewhat cruel to deceive his wife, when she has been awaiting his return for 20 years. Your blog showed that deceiving his wife was necessary to remove the suitors. It is a shame Penelope doesn’t have the ability to fend for herself, like a modern women would be able to. Overall, nice blog and a like how you answered the questions concisely. In these few pages, Odysseus returns home to his family, only to find a line of men ready to marry his wife, Penelope. The only one who knows that he is home is his son, Telemachus. He does not tell his wife of his disguise in fear of spoiling his plan. Odysseus has a plan to force all the men out of his home. He dresses up as a beggar as a disguise in order to kill all of the suitors. As much as Odysseus deserves to come home after 20 years, to his family in peace and calm, Odysseus does not have the right to kill all the men waiting in line, ready to marry Penelope. The difference of gender roles is clearly shown in the past few pages. Penelope is a house wife, struggling to keep men out of her home. Of course, right when Odysseus , her knight in shining armor leaves, these men come pouncing at her door, ready to make her their next trophy wife. That is all she is. She is a prize, waiting and ready to bought. All she is trying to do is stall as much time as possible until Odysseus comes home. In this past passage, we can see that their view on gender equality is quite alarming. Great Job, Anjali! You did a great job explaining, with excellent points and analysis. Great job keeping your response concise yet great. Keep up the great work. In the readings of the Odyssey, Odysseus returns home to Ithaca. We the readers are given a glimpse of the condition of Ithaca during Odysseus’ temporary absence. Odysseus arrives home disguised as a beggar, only to see a crowd of men trying to marry his wife, Penelope. These men believe that Odysseus is dead, and as a result are pursuing his wife. The suitors that are trying to marry Penelope are surviving solely on the food that Odysseus provided. Odysseus, who was still disguised as a beggar, informed Penelope that Odysseus is almost home, as a way to cheer her up. Knowing she might have to choose another husband, she challenges the men to shoot an arrow through seven ax heads, to be her new husband. Unsurprisingly, Odysseus easily completes Penelope’s challenge and is joined by Telemachus, his son, after doing so. After reading this story, lots of information can be extracted about Odysseus, Penelope, as well as Ithaca. It is evident that Odysseus is necessary for the island of Ithaca to thrive, and without him, they most definitely aren’t the same. Without him, there seemed to be no order in the society, with multiple suitors pressuring his wife to marry them. In addition, present-day ideas about gender equality are different from those demonstrated in The Odyssey. In the time period of Odysseus, women were just in charge of running households, staying at home, and holding low importance to society. Penelope, like the women of her time period, followed this gender role that all women were expected to follow. Men were supposed to be the leaders of their families and had a higher importance to society. Nowadays, this has drastically changed with women having all the same opportunities and social importance to men. Gender norms have come a long way, and continue to change. Just recently in the United States, Hillary Clinton, a woman, was narrowly beaten in an election that she was projected to win to become President of the United States. This definitely wouldn’t be the case in the times of Penelope and Odysseus. Furthermore, many important and significant events occurred in the Odyssey, with some relating to present-day gender equality. Great job! I love the way you connected this part of the epic poem to present day! Keep up your analysis, you’re doing great! Good job Ajay. You really delved deep into the text and gave a great analysis. In reading this part of The Odyssey, we noticed many things that have happened. The way gender was viewed in that era definitely influenced this part of the epic poem. The way the suitors were allowed to tramp around Odysseus’ palace without any way that Penelope could tell them to leave. She acted helpless and powerless without a husband. This shows just how much the world has changed. Not just gender norms, but other technologies that have influenced this change. Odysseus, disguised as a beggar, returns home to Ithaca. Thinking that Odysseus is dead, the suitors try to marry Penelope. Odysseus, still disguised as a beggar, tells Penelope to stay hopeful, as Odysseus is on his way home. The suitors are extremely disrespectful, to women, and the poor, however, Penelope is being pressured to choose one of them as her husband. Today, women being harassed is something that is completely unacceptable, while back then, it was considered normal and something that you could just do. Women are given more rights, and are thought to be equal to men, even though some still disrespect women. We still have problems regarding women’s rights and women in general, so the problems from a long time ago is still not completely solved today. While we had/are having lots of technological advancements, and advancements in government, the problems with women is still going on today, which shocks me. Anyways, back to the story line. Penelope is forced to choose a husband, so (still hopeful on Odysseus’s return) she decides to hold a “contest” that will determine who(m?) she will marry. She will marry the man that can string Odysseus’s bow and shoot an arrow through twelve axhandle sockets. All of the suitors fail, and Odysseus asks for a turn. “..,so effortlessly/ Odysseus in one motion strung the bow./ Then slid his right hand down the cord and plucked it,/ so the taut gut vibrating hummed and sang/ a swallow’s note,” (page 10350). The suitors lay in shock, while Odysseus joins Telemachus. In tonight’s reading, gender-equality was a huge part, and through Penelope, we can see the harsh treatment of women in the past. Odysseus did not tell his wife his identity, but it wasn’t necessarily wrong. He gave his wife hope through the beggar, and he will reveal his identity later. It is important for Odysseus to keep hidden in order to plot a revenge plan for the suitors later. After reading pages 1029-1037 in our textbook version of The Odyssey, I am moved by how Penelope manages to keep her suitors at bay. Faithful and loyal to her husband Odysseus, when her suitors arrived she was loath to marry one of them. She would never marry any of them, and so she waited for Odysseus to return from Troy. But the suitors kept pestering her. They all wanted to marry her, and have her for themselves. She was determined not to let them. “How could I? / wasted with longing for Odysseus, while here they press for marriage,” (ll. 1318-1320, p. 1032). However, unlike Odysseus, she just wishes the suitors to go away. Except Antinous. Antinous she wants dead. “ ‘Oh, Nan, they are a bad lot; they intend / to ruin all of us; but Antinous / appears a blacker-hearted hound than any,’ ” (ll. 1272-1274, p. 1031). Odysseus, on the other hand, wants revenge. He wants to kill them all for what they made his wife go through and how they’ve been treating her. Also contributing to this fact is that they also betrayed Odysseus, in a way. By trying to steal his wife, they signed their death warrants. “ ‘I came / to this wild place, directed by Athena, / so that we might lay plans to kill our enemies,’ ” (ll. 1080-1083, p. 1025). Odysseus plans on leaving no suitor alive. As for hiding his true identity from Penelope, I think he was justified. It makes sense that he would think that the less people know, the better. After all, Penelope could accidentally tell someone about Odysseus’ identity. Or worse, someone could be listening to their conversation. It just didn’t seem like a good time for him to tell her. After all, she already liked him more than the others. If she didn’t take issue with him, then there was no danger. Also, I think Odysseus’ hubris had something to do with it. He might’ve wanted to make a spectacle or something, so that he would be in the spotlight. We already know that Odysseus is arrogant. It wouldn’t be too far-fetched. In the end, many of the characters are developed in this part of the story. We learn about Penelope, Telemachus, and Antinous, and what kind of characters they might stack up to be later in the story. It is very true that there was no time for Odysseus to reveal himself to Penelope. And that Penelope also exhibited great strength against the suitors, all because she believes her husband will return. She shows characteristics that the suitors are lacking. Love, patience, loyalty, and true strength. Good work! In “The Suitors,” Penelope is very distressed, however the horde of suitors have become status quo in her life. This is the first time Odysseus has met the suitors and he is disgusted by the men’s behavior, especially that of Antinous, and his head was “containing thoughts of bloody work…” (pp. 1030) Odysseus kept his identity a secret because then everyone knew exactly who to target. If they saw Odysseus, the suitors would’ve done everything in their power to stop him from getting to Penelope. Now that he was disguised, they did not expect him to have any strength, so when he did reveal himself the suitors were unprepared to fight back anyway. It was Odysseus’ mission to return to Ithaca and murder the suitors. It was unnecessary to remain hidden to Penelope, however. It wouldn’t matter anyway, because she would go along with his plan. The Odyssey shows references to modern day gender roles in society. Odysseus is the one going on the journey, performing heroic acts, while Penelope is sitting at home waiting for his return. She is helpless against the suitors because she is so tired of waiting for an escape, so she just gives up. The suitors are so eager to have Penelope’s hand, that they ignore what she wants. They will not leave her alone because they just want her riches, and they just want a woman under their arm. After rereading the sections that we had read of on Friday, I’ve started thinking about Odysseus and how his appearance is masked. Athena masked his true identity behind a body of a poor beget. Only his son, Telemachus, knows his real identity and what he plans on doing to the suitors. This whole concept of tricks and mirages all ties into more appearance versus reality, which seems to come in nearly every story we’ve read. Especially in mythology, where gods are commonly portrayed as beggars when confronting humans. Clearly, Antinous was deceived by this image because it was him who threw the chair at Odysseus. However, when he confronts his wife, what is the reason behind him not revealing his true identity to her? He tells his son his true identity, but that appears to be only so that he may help Odysseus kill the suitors by taking the weapons. One reason he may have kept it hidden was to keep his plan safe. Had he disclosed to his wife that he was home, she might tell all the suitors to just leave, which would not allow Odysseus to get his revenge. However, while Odysseus kills them all, what if her wife were to try and intervene? What if she attacked Odysseus not realizing who he really was, in the same way Antinous did? I don’t think that this is the main reason behind him not revealing his identity, but I’m not exactly sure on why it’s a secret. It’s your wife for crying out loud! She hasn’t seen you in 20 years! Can’t you just tell her who you are and trust her to keep it a secret? Maybe she would tell everyone that they were in danger just to prevent their death, but it’s just a bunch of what if’s at this point. Can anyone help, or can we discuss this in class? The Odyssey, we see how Penelope, like many or all women at the time spent their lives providing for the household and her husband. The woman’s role at the time if the family had money, was strictly to stay home, watch the children, clean and take care of the house. She was not to go out and get a job, and wouldn’t be caught doing anything that was considered a so called “man’s job” because that was just considered wrong. This way of life continued for many years to come and although the view of women has changed and gotten much better, it is still not one hundred percent different. Women today are allowed to do mainly anything that a man does, a woman with a job and a really fulfilled life will not be looked down upon. Woman everyday go out and make something of this world and that is a powerful thing because people like Penelope didn’t have that luxury. Penelope was to stay home and do nothing while her husband went off to war in Troy for ten years. It was expected that whatever he said, she would comply with, and this system went on for a while. The gender equality difference at the time is important to this epic because many things would have changed if men and women were seen as equals at that time. Who knows, if it were different you might’ve heard of Odysseus’s best men and women other than just all of his best men. Life then was different than it is today and that is what is so great about Epics like Odysseus that have been passed down for so many years, they teach us about our past and help us to not make some of the same bad decisions in the future. In this weekend’s reading gender roles play a big part in the story. Odysseus returns from Ithaca and hears that there are men living in his house, trying to marry his wife. The men were living in his home, eating his food and cattle, and pretty much destroying the house.Penelope-Odysseus’ wife- does not like the men living in her house, but she has no say in them staying or leaving since she is a woman. Although she lives in, and runs the house, since she is a woman she has no say in what goes on. Penelope hates one man in particular,named Antinous. When Odysseus returns home, disguised as a beggar, Antinous is the one that goes to him and disrespects him. Odysseus gets mad since they are living off of his food and says, “You sit here, fat/ on others meat, and cannot bring yourself/ to rummage out a crust of bread for me!” (page 1029). Antinous throws a stool at Odysseus in anger. Penelope goes to Odysseus to ask is he is alright, and since he is disguised as a beggar he tells her that Odysseus is alive and will be home soon, but Penelope knows that she will have to find a new husband and says that whoever can string Odysseus’ bow (which is supposed to be super hard), and shoot an arrow through seven ax heads will be her new husband. Nobody can do it so Odysseus is given a chance. “slid his right hand down the cord and plucked it,/ so the taut gut vibrating hummed and sang/ a swallow’s note./ In the hushed hall it smote the suitors/ and all their faces changed,” (pages 1035-1036). Odysseus completed the challenge easily and proves himself as Odysseus. Throughout this tale we see Penelope’s opinions being discarded by the men, as if she is unimportant. The only thing is that she is the one who decides who will become her husband, so why are the men being so rude to her? You would think that they would try to treat her like a goddess so that she chooses him, but nope. The men know that she must choose a husband so they all treat her like trash. This is where the gender roles come into play. Although Penelope really is important since she chooses which man to marry, since she is a women they treat her horribly anyway. Hailey, I agree with you that it’s an injustice for the suitors to treat Penelope so poorly, especially because they want her hand in marriage. You have very good analysis and evidence in your response, great job! After rereading 1029-1037, I have many thoughts about Odysseus and Penelope and the many suitors running amuck in their home. Penelope has severe distaste for the suitors and wishes them to leave. She feels trapped in her own home with people she doesn’t want around, these people also turned up uninvited forcing themsleves on her while she’s grieving the supposed loss her husband. but Odysseus loathes them. Like, he has a blinding hate for these suitors so much so that the plans to murder them all and he does. Personally, I feel Odysseus’s killing spree was one hundred percent justified. They were plotting to kill his son for no reason, and they treated Odysseus like trash when he was trashed like a beggar. Antinous even threw a stool at him, and they were the trash trying to marry his wife without even knowing he was truly dead. I think Odysseus was defending his wife from scumbags, hi son from death. Also Odysseus shouldn’t have revealed himself to his wife because it would probably send her into a shock and panic, also it really would ruin his reveal when his passes Penelope’s test. He probably wouldn’t even be allowed to compete and prove to them men he mistreated him who is truly inferior. The way his wife has been suffering because of these men deserved something grand and Odysseus delievered. During tonight’s reading, Penelope seems to be disgusted with the suitors and the way they act. She is so disgusted that it fills her with a hatred strong enough for her to wish them all dead. “Would god you could be hit yourself, Antinous, hit by apollo’s bowshot… If all we pray came to pass then none (of the suitors) would live till dawn”(Pg 1031 lines 267-268½ 270-271½)This is evidence of the characterization of Penelope. It proves that she is strong and loyal, and does not give up easily, but stays true to her husband who she believes to be still alive. She even goes as far as to attempt tricks upon the suitors so that they may be delayed in marrying her. The feelings of Penelope differ from that of Odysseus, as he does not see them with disgust, but a pure hatred for the way they act and the deeds they have done. While Penelope is forced to fear them by their power over her, Odysseus has the power and strategic knowledge to overpower and overthrow their unjust rule over his home. In order to use this strategic knowledge, however, he must deceive Penelope his own wife, for a short period. This is necessary because, if Penelope’s attitude and feelings towards the suitors had been changed by the new that Odysseus was home, then the suitors would most definitely notice, rendering Odysseus plan to take his home back a failure. This justifies that he does not tell her Immediately, as he does much more good and saves her from much more sorrow and pain than he gives her if any at all. As we read about Odysseus’ cloaked return home and his experience with the suitors, it is easy to see just how unjust it is for them to mistreat Penelope. In those times, women had no voice, no opinion, and had their worth decided by how attractive they were. They were mere trophies to be won by the men, and it is reflected by those awful suitors’ treatment of her. They came into her house, ate her food, took over her living space, and considered her as nothing more than a small obstacle that could be crossed through marriage. Her and Odysseus’ feelings at this time are very different, thanks to gender roles. Penelope’s feelings are more of a loss of control and of helplessness. Odysseus’, however, are feelings of restoring pride and taking revenge. If that doesn’t scream gender roles present in mythology, I don’t know what does. Of course, they both miss each other and wish to see one another again, but the underlying emotions are much deeper than that. Odysseus’ masculinity gives him a great sense of pride, and therefore of revenge on the suitors. Penelope’s inability to do more than look on as everything she has is taken away from her, is thanks to her femininity. In modern times, if a guy makes a pass on a girl and she declines his attempts by saying “No, thank you, I’m just not interested,” the guy will often persist and continue asking, pestering her with “Come on, give me a chance, I’m a really nice guy,” and so on. Not until the girl says “I have a boyfriend,” does the guy finally back off. From how I see it, this is because he wouldn’t dare intrude upon another man’s “territory” or “property.” Just the mention of her boyfriend is more valuable than the girl’s own words and opinions. This is seen in Penelope’s struggle, as as soon as everyone proclaims Odysseus dead, the suitors come flocking to her, because the one thing that matters to them is now out of the way. In an attempt to regain her control, Penelope tricks the suitors by weaving and unweaving a shroud for her husband. She keeps this up for 3 years, and it keeps them at bay. The fact that it was a matter of her husband’s honor was more important to them than Penelope’s own wishes and pleas. In the part of the Odyssey that we read Odysseus finally comes home, but he sees a bunch of suitors asking the hand of his wife’s marriage. Instead of revealing himself right away to everyone he only revealed and reunited with his son who plots with Odysseus to get penolepe back. The plan was for him to disguise as a better and gradually win challenges for Penelope’s hand in marriage. Then he will reveal himself and kill all the opposing suitors. The plan goes exactly as planned and Odysseus is reunited with Penelope. My interest about this part of the story is Penelope’s actions towards the suitors. Instead of giving in to them she tricked them by telling them she needed to make a shroud and undoing her work everyday. This really shows how Penelope can be even at this time period. Clearly the gender roles give little to no independence to woman. Right after Odysseus is presumed dead people expect her to marry them. Penelope doesn’t have any choice of her own and cannot do what she wants. She can only follow the men in her life. In the reading for homework. We read “The Suitors.” “Penelope” and “The Challenge.” from The Odyssey. These stories were very interesting and I have many ideas about them. Penelope was very uncomfortable with the suitors in her house, she did not want them there. Odysseus did not like them either. The text states, “You dogs, you never thought I would any more come back from the land of Troy, and because of that you despoiled my household, and forcibly took my serving women to sleep beside you, and sought to win my wife while I was still alive, fearing neither the immortal gods who hold the wide heaven, nor any resentment sprung from men to be yours in the future. Now upon you all the terms of destruction are fastened.’’ I feel bad for both of them because Penelope has suitors because of Odysseus’ long absence. They assume that he is dead, and they hope to marry Penelope to inherit all that she has. The reason Odysseus doesn’t reveal himself is to test Penelope’s faithfulness. Furthermore, by remaining hidden from Penelope, he can take care of his business with the suitors, and reveal himself when he is ready. Odysseus wishes to come back to Penelope a man, having dealt with all the problems in their house first. I think it was wrong for Odysseus to deceive his wife, but I do understand why he did. He hasn’t seen Penelope in years and want to know how faithful she has been, he has probably worried about that in his whole journey. However, Penelope needs to be free and I feel so bad for all the troubles she has gone through. I see a lot of present day gender roles in these stories. I thought of the idea of how powerless Penelope must feel. She is constantly being tormented by her suitors and it is hard for her to escape them. The suitors can even be compared to cat-callers and other men who harass women today, which is not right at all. In pages 1029-1039, we read the build-up to the great climax of The Illiad. Odysseus finally reached home to Ithaca, but only to find his house overrun by evil suitors, who, in Odysseus’ absence, have taken control, since there was no man to own the house. In these ancient times, gender equality is practically non-existent, where women are treated more like status symbols based on how beautiful they are. Women were not allowed to own property, The suitors take advantage of this for their malicious intents. When Odysseus finally does return, he knows that his house will be in evil hands, so instead disguises himself as a poor man. He probably did this to sneak up to the suitors and make a critical strike while undetected. In this context, it worked out for Odysseus that there was a clear leader, Antinous. He enters an archery contest and shows everyone how easily he shoots so accurately with the bow nobody could shoot. In this shock, he kills Antinous, fully revealing that he was Odysseus. He kept the secret even from his wife beforehand, most likely to have a flashy entrance, which really is no grounds to make her suffer any longer than she needed. But the climax appears to be the grand fight between the suitors and Odysseus along with whoever is still by his side.